Today's construction and agricultural machinery manufacturer Kubota, headquartered in Osaka, has its origins in the production and sale of cast metal products. The company was founded in 1890 by 19-year-old Gonshiro Kubota as a foundry. At that time it was called Oide Chuzo-jo (Oide foundry). At that time, castings were manufactured for weighing facilities and consumer goods of daily use. In 1897 the name was changed to Kubota Tekko-jo (Kubota Ironworks). 1922 began the production of the first engines for agriculture. The engines were a great success in Japan and in 1947 Kubota developed its first motorized tiller. The company is now called Kubota Corporation, is represented in over 110 countries and employs nearly 40,000 people. Today's product portfolio includes tractors, wheel loaders, plows, motors, hydraulic hammers, balers and much more. Generators, water treatment plants and water pumps are also offered by Kubota. 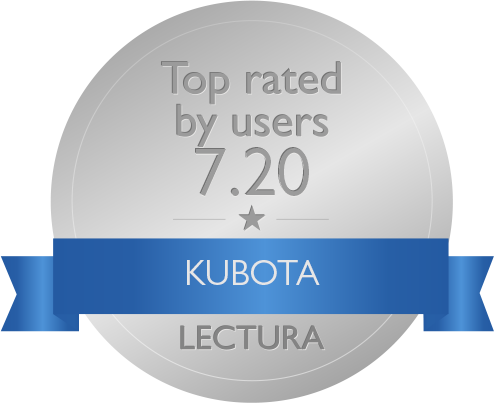 According to Kubota, the guiding principle is always to work in the interests of society. They want to pave the way for a better future. The brand message "For Earth, For Life" also shows that Kubota attaches great importance to the topic of environmental protection. This corporate philosophy was not only integrated into a new brand name logo in 2012 but also firmly anchored in the company's principles. Also in 2012 Kubota Corporation acquired the Kverneland Group and is now the sole owner. In 1960 Kubota introduced its first agricultural tractors to the market. The tractors "Made in Japan" have since been considered the market leader. Today's product range covers a wide variety of applications. Kubota offers everything from compact tractors to big four-wheel tractors. According to Kubota, the introduction of further larger tractors is currently being planned, especially for large-scale farms. Kubota´s tractors vary from market to market as they are always tailored to local needs. The product range includes lawn and compact tractors, which are used in agriculture, as well as in industrial and private environments. Her main tasks are lawn and property maintenance. These include, for example, the models of the series B1, B2, BX and GR. They range in engine power from 12 hp in the Kubota B1220 to 58.6 hp in the Kubota L5740 HSTC. According to Kubota, the larger agricultural tractors of Kubota, like the M7001, can convince with the same maneuverability as the compact models. With up to 170 hp, they are quite powerful and are used in agriculture, especially for the usual heavy pulling work. In general, Kubota distinguishes between the standard tractors, such as the Kubota M8540 or M100 GXII, the narrow track tractors, which include models such as the M6040 N or the M8540 N, and the plantation tractors, such as the Kubota M9540 LP, among the agricultural tractors. By and large, in Kubota's offer should be found a suitable model for any application. Kubota offers both mini and midi excavators with tracks. The mini excavators include models such as the K008-3, the KX019-4 or completely new models such as the KX042-4 and U36-4. The latter is a 3.5-tonne excavator with a spacious 5-tonne cab. Thus, this compact excavator offers the driver a greater entry and more freedom of movement in the foot and interior, which ensures maximum comfort during use. The K008-3 is the smallest excavator in the Kubota portfolio, with a gross weight of 980 kg, a transport length of 2750 mm and a maximum width of 860 mm. Kubota promises high flexibility and versatility with the KX19-4. This mini-excavator from the weight category of 1.5 to 2 tons offers a sensitive control, automatic travel speed switching and a very comfortable cab. For larger missions Kubota offers the KX080-4α, the largest crawler excavator in the program. This has 63.2 hp at 2000 rpm and has an operating weight of 8,315 kg. The power comes from a Kubota diesel engine with Common Rail System (CRS). In addition, a diesel particulate filter (DPF) is installed in the silencer. With Eco mode (ECO e PLUS) you can achieve 3% higher productivity and 27% lower fuel consumption compared to its predecessor. The power mode even provides 7% more productivity while saving 17% fuel. Kubota currently offers three wheel loader models in Europe. The R082 is the latest model of the Japanese. The models R065HW and R085 complete the program. The R065HW is powered by a 47.3 hp (34.8 kW) Kubota diesel engine. It convinces by a low noise level, low vibration and economy. Furthermore, all daily maintenance components can be easily and quickly achieved. This ensures a short service life. The cab offers a good overview thanks to full glazing, modern digital displays in the interior, a sprung driver's seat and many other aspects for high driving comfort. The R085 also convinces with the same comfort and maintenance accessibility of the R065HW. With four different operating modes available to the driver, the travel drive can be optimally adjusted to the given requirements in use. You can choose between the normal operating mode, which is set by default when starting the machine and is suitable for all normal loading, material and transport work. The Power mode for maximum traction and thrust, the Eco mode for lower fuel consumption (around 10 - 15% ) and (ATT) attachments mode, which allows to operate attachments with constant speed and hydraulic oil quantity. All in all, the Kubota wheel loaders are designed to make the work of the drivers easier and safer. To be able to guarantee that, Kubota relies on a generous standard equipment, such as a heated cabin, an adjustable, weight-dependent driver's seat with arm and backrest, a lifting arm lock and more. Kubota offers various balers. The bale diameter varies depending on the model between 60cm and 200cm. The two models BV5160 and V5200 produce bales with a diameter of 0.6-1.65m (BV5160) or 0.6-2.0m. The bales of the presses BF2255, BF3255 and BF3255 Flexiwrap have a diameter of 1.25m. Flexiwrap models also combine the pressing and winding process, which significantly reduces working time on the field. The pickup of all current Kubota presses is 2.20 m wide and has 5 tine rows with a tine spacing of 60 mm. In terms of weight, the presses range from 2,900 kg (BF2255 SC-14) to 6,510 kg (BF3255 SC-25 Flexiwrap). Other benefits that the Kubota presses have in common include, but not limited to, the reliable and fast PowerBind netting, a parallel lowerable bed floor and a split main rotor and press chamber drive. The Flexiwrap models are built on a very sturdy frame as standard. This contributes significantly to certain durability of the machines. In addition, the Flexiwrap models have a particularly low table height, which allows a smooth bale placement. For loading in a very small space Kubota recommends the KC70. With a total width of 880 mm and a height of 1960 mm, it is ideally suited. It has a payload of 700 kg and reaches with its 5.6 hp a maximum speed of 4.3 km/h. A Kettendumper promises fast and effective missions Kubota with the KC70HV-4. This, with a total width of 785 mm, very narrow dumper makes 9.4 hp (7.1 kW) at 3,500 rpm and holds about 340 liters. He also achieved a maximum load capacity of 700 kg. The KC110HR-4 (1,000kg), KC250H-4 and KC250HR-4 (each 2,500kg) models only offer higher loading capacity. These dumpers also have a much higher performance. The new KC110HR-1 has a Kubota D722 engine delivering 15 hp (7.1 kW), and the KC250H-4 and KC250HR-4 have 45.5 hp (33.4 kW) from a Kubota V2203-M engine. The two KC250 models can cope even with gradients of 20 ° at the front and 25 ° sideways. The fuel tank holds 40 liters in these models, while the KC110HR-4 only holds 20 liters. Due to their high performance, the KC250H and KC250HR crawler dumpers are in demand when it comes to universal and effective applications. In addition, double rollers ensure improved chain guidance and more stability. The loading tray of the KC250HR is also rotatable through 180 °, which increases the application possibilities in a small space. Kubota offers a variety of different mowers. The portfolio of the Japanese manufacturer includes both front and rear mowers with discs. These are available with or without conditioner. In addition, drawn disc mowers with conditioners complement the offer. The smallest mowers currently offered by Kubota are the DM1017, DM1022 and DM1024 from the DM1000 series. They are available in working widths of 1.65 m for the DM1017 to 2.40 m for the DM1024. These mowers are attached laterally. With a weight of 388 kg (856 lb) in the DM1017 they score with a low power requirement as well as the other two models of the DM1000 series. The weight of the DM1022 is 430 kg (948 lb) and that of the DM1024 is 450 kg (992 lb). Larger mowers, such as the models DM3028 - 3040, offer a working width of up to 4 meters. Kubota offers the two models DM3087 and DM3095 especially for mowing large areas. These models have a working width of 8.70 m (DM3087) or 9.50 m (DM3095). These are mowers with center suspension. For transport, the mowers are brought into a space-saving vertical position. So Kubota always offers a suitable attachment, even for the smallest mowing work up to operations on very large areas. Kubota offers different concepts for seeding. From universal sowing machines, such as the SC1300, to superstructures for rotary harrows, such as the MD1300MP, to precision seed drills and front tanks, the Japanese offer everything. The bodies and front tanks are always designed to provide weight distribution. Furthermore, there are numerous possible combinations of the individual products. For example, the SH1150 front tank can be combined with all the CB1000 series bodies. The two series CB2000 and TD1600F, however, are offered in combination with the SH1650. The mechanical seed drills MD1300MP and MD1400MP are used in combination with rotary harrows, but can also easily be dismantled and used separately. The MP1000 models were specially designed for the single grain sowing of beet canola and chicory. These work with so-called zero deposit and guarantee, according to Kubota exact depth control. The large, drawn universal seed drills, for example from the SC1000 series, are particularly convincing due to their high working speed (10.18 km/h) and precise seed placement. Due to the fact that they have a modular frame concept, these machines can also be adapted easily and exactly to the requirements of the respective customer. Kubota's product range includes various power harrows. Both rotary harrows, which are sufficient for medium-sized companies, as well as those that have been specially designed for use on particularly large areas are offered by the Japanese. Kubota attaches particular importance to a robust bath construction. This should guarantee the user a comfortable and efficient work and ensure a trouble-free operation. Furthermore, Kubota has placed its focus on the development of power harrows on a high reliability. The series of Kubota are divided into rigid and folding power harrows. The series PH1000, PH2001 and PH3000. The two models PH1250 and PH1300 belong to the PH1000 series and are considered as medium-heavy power harrows. They are used for tractors with up to 140 hp. They are especially convincing due to the stable, self-supporting tub construction. In addition, the robust three-point tower enables easy connection with different tugs and the construction of heavy drills. For tractors up to 180 hp Kubota offers the series PH2001 with the models PH2301, PH2351 and PH2401. 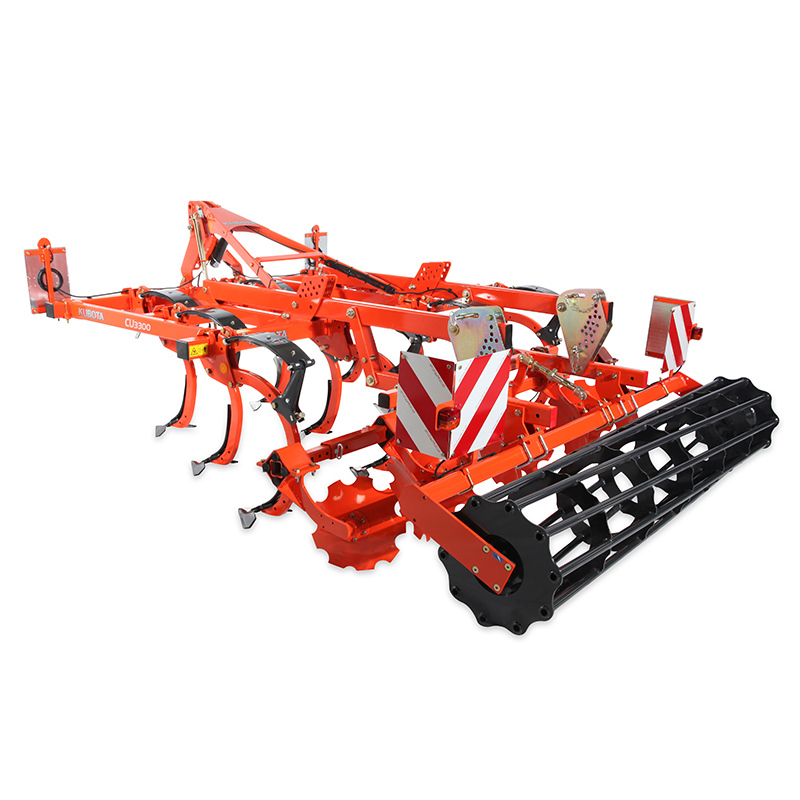 These offer the user, among other things, the advantage of two profiled plates with 6mm thickness, which allow for a higher torsional stiffness of the rotary harrow. The PH3300, PH3350, PH3400, and PH3450 are PH3000 series. With a weight between 1940kg and 2670kg and a working width between 3.0m and 4.5m they are designed for tractors with up to 250 hp. Durhc this wide range of power harrows, Kubota can offer a suitable device for a variety of uses. Kubota offers a variety of cultivators on the market in the field of tillage. For tractors from 100 hp, Kubota recommends the models CU3300CD - CU3500CD from the CU3000CD series. These are universal cultivators with working widths of 3.00 - 4.00 m and working depths of 5 cm - 30 cm. The CU2250 and the other cultivators from the CU2000 series are designed for versatile use on tractors with 65 - 300 hp. They are available in working widths from 2.5 m to 4.0 m. For tractors with a power of 90 - 230 HP Kubota recommends the two series CU3000 and CU3000C. Just like the models of the CU3000CD series, the cultivators of these two series have working widths between 3.00 m and 4.00 m. Also, the working depth of 5 cm to 30 cm is identical. The "C" variant differs from the other models in that point, that it can be combined with a towing tine unit and almost all available trailers. This cultivator models are a bit shorter and thus ensures a lower lifting power requirement of the tractor. For the CU3000, CU3000C and CU3000CD series, numerous coulters, rollers, leveling tools and caster tools are also available. This allows the cultivators to coordinate perfectly with their use. In the product portfolio of Kubota are also some field crop sprays to find. The Japanese offer 2 different series of sprayers. The XMS1 series combines models with 800, 1000 and 1200 liters tank capacity. For this, the buyer can choose between two different jib types. You can choose between a HOSA aluminum boom measuring 15 meters and the HC steel boom with 18, 20 or 21 meters. The easy-to-operate field sprayers of the XMS1 series are available with a pump capacity of 100, 150 or 200 l/min. All models have a control center, a wash-in lock, a hand wash tank and a protective clothing rack. The field sprayers are controlled by an electric remote control or the FlowMate Control spray computer. Thus, the operation, according to Kubota to a ease. 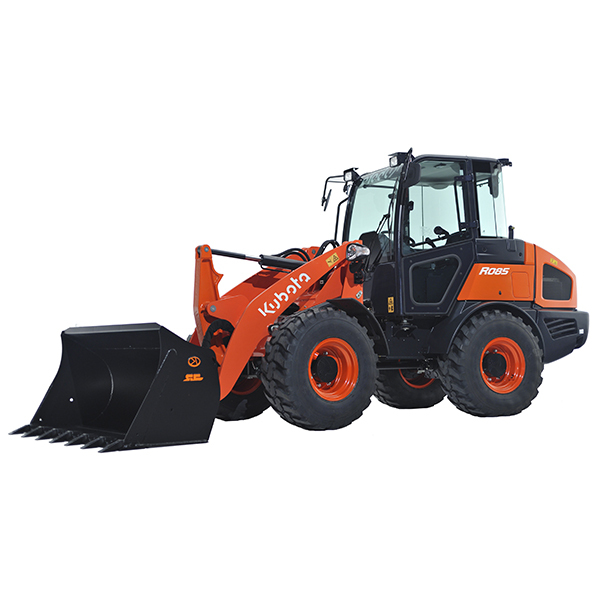 The second series that Kubota offers is the XMS series with the XMS210, XMS213, XMS216 and XMS218 models. They have a pump capacity of 150 - 260 l/min. The tank volume corresponds, depending on the model, from 1000 to 1800 liters. This series is also available with two different linkages, the HOSA and HC. These are available with working widths of 15 to 30 meters. As front tank the models XFT211 Comfort and XFT211 Pro are available. Both have a nominal volume of 1100 liters, as well as an autonomous suction filter and an automatic stirrer shut-off. The XFT211 also has the IsoMatch Eye camera and is compatible with the XMS iXclean Pro adapter kit. 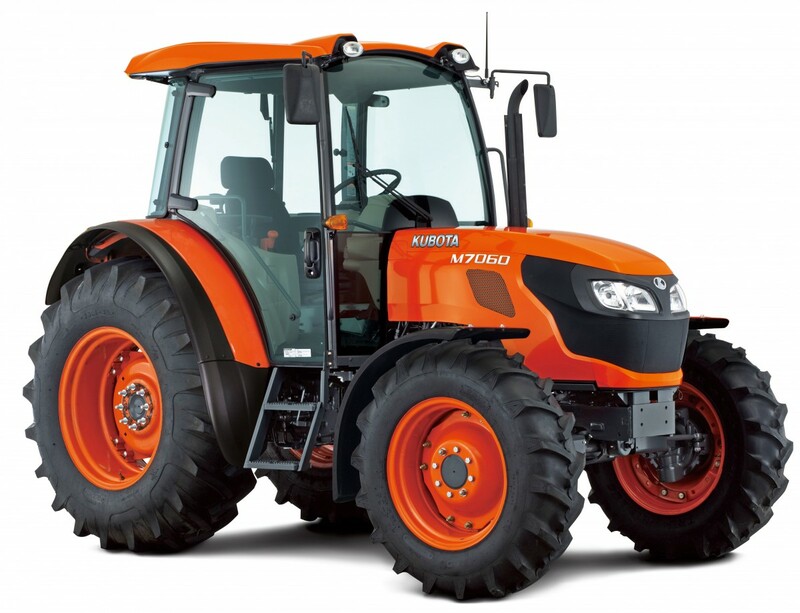 In general Kubota distinguishes between different generations of M series tractors. The first M-series tractors, the models M95S, M105S, M108S and the compact model MK5000, were built in 2005. Since 2011, a new generation of the M series are produced. These include models such as the M6040, M7060, M9540, M6060 ROPS, M7040N or M9540N. The latest models include the M7002 series. These are the M7132, M7152 and M 7172. They have a modern V6108 engine with bollard and intercooler. The performance of these tractors ranges from 130 hp (95 kW) in the M7132 to 170 hp (125 kW) in the M7172. In addition, these models have additional reserves. With the Power boost 20 (with the M7131 and M7152) or 5 HP (with the M7172) more can be retrieved. For these three new models, it was particularly important to use less fuel than their predecessors despite higher performance. This was achieved by optimizing engine tuning. The maximum power is now achieved at a lower engine speed (1900 rpm). The new 6-speed Powershift transmission offers 30 forward and 15 reverse gears (V54 / R27 with crawl) and helps the models of the M7002 series by more levels than before for easier and faster shifting. The cabin was equipped with a new cover material. This new interior material provides better protection against scratches and other damage. In addition, all control buttons have been designed ergonomically. To further enhance driver comfort, a new premium seat incorporating improved suspension and upholstery and larger armrests has been added, enhancing the cable seal to minimize the noise level inside. However, the functions of the installed K-monitor have been extended. For example, the update has increased the memory for the headland management system HMS. Now you can save up to 20 set-ups. Furthermore, individual driver profiles can also be saved. Kubota's MGX series has been in existence since 2016. It includes tractor models such as M110GX, M128X, M135GX, M100GX-II, M110GX-II, M128GC-II, M135GX-II, M95GX-II, M105GX-II, M115GX-II, M125GX-II and M135GX-II. Currently, the MGX-III series is already on the market with the models M95GX-III to M135GX-III. Thanks to modern engine technology, these models can convince especially in hard practical use. In doing so, they prove their economic efficiency and environmental friendliness. In June 2018, it was announced that Kubota will launch the MGX-IV series. This should clearly differ in terms of design, braking performance and hydraulic system from the previous models. For example, the newly designed cabin of the M7002 series was taken over. The five new models will be equipped with an 8-speed powershift transmission with three groups. 24 forward and reverse gears are provided to the driver. Among other things, an alarm indicates that the driver has left the seat without activating the parking brake. In terms of engine technology, the 6.1 liter V6108 with 4 cylinders and the V3800 with 3.8 liters displacement and also 4 cylinders are used. The power ranges from 104 to 143 hp. 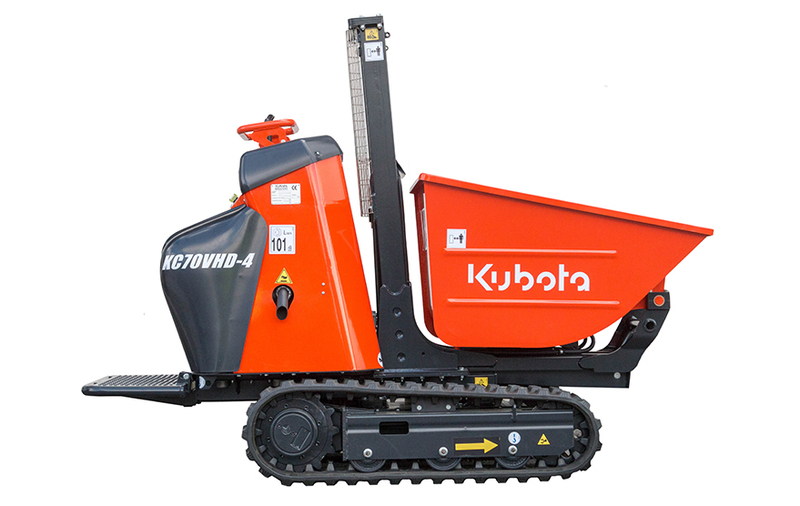 According to Kubota lifting forces between 5000 and 6100 kg in the rear should be feasible. The built-in hydraulic pump makes, according to the manufacturer, depending on the option 133 or 143 liters per minute. On the front axle of the tractor sensors should be attached, which should help with the turning maneuver. When turning the four-wheel drive is automatically switched off whereby an optimum turning circle at maximum headland and tire protection is guaranteed. The CU2000 series combines the two-bar cultivator models CU2250 to CU2400F. These are designed for tractors from 65 - 300 hp. The CU3000 series includes models CU3300 to CU3400CF. To optimize the incorporation and leveling of the cultivators, a variety of additional equipment is available for the models of these two series. The CU2000 and the CU3000 convince with their high performance. For tractors up to 240 hp Kubota offers models with up to 3 meters working width. For stronger tractors up to 300 hp Kubota has folding machines with up to 4 meters working width in the program. Kubota uses fine grain steel and a special hardening process to achieve a long life of the cultivators. The very light hollow-tipped technology with its 35 kg offers enormous flexibility. The tine arm of the CU2000 models can swerve up to 20 cm to the side. For the CU3000 models this is possible up to 14 cm. As a result, obstacles can be bypassed in three dimensions and the load on the tine holder and frame structure is reduced. Already during the conception phase, all models undergo various tests in order to precisely illustrate load points. All this increases the reliability and longevity of the cultivators. The folding models CU2400F and CU3400CF have an automatic transport lock. For road transport, they can be folded to a width of 285 cm. This ensures maximum safety during transport. Park stanchions are available as standard to safely park the cultivators. The PH1000 series includes Kubota's medium duty power harrows for tractors up to 140 hp. This series has been specially developed for difficult ground conditions, so the main focus during development was on reliability and a stable bucket design. To achieve this one sets, among other things, on a large distance of the tapered roller bearings, a self-supporting and strong gear tray and continuously hardened gears. The tub of the PH1000 models has a thickness of 5mm and measures 120 x 400mm. Furthermore, a 10 mm thick reinforcement plate is installed. The PH1000 series includes the two models PH1250 and PH1300. These have 2.5 and 3 m working widths and have 10/20 and 12/24 gyros respectively. With Packer, the weight of these rotary harrows is 1,270 kg (PH1250) and 1,410 kg (PH1300). The next larger rotary harrows belong to the PH2001 series. These are the models PH2301, PH2351 and PH2401. These are the successors of the PH2000 series and designed for tractors with up to 180 hp. Their working width ranges between 3 and 4 meters. They are suitable for almost all operating conditions and have, just like the PH1000 series, a robust bath construction. Two profiled 6 mm plates ensure a high torsional stiffness of the 140 x 400 mm tub. Compared to the previous PH2000 series weight could be saved and the center of gravity moved forward. The large rotary harrows are assigned to the PH3000 series. These include the models PH3300, PH3350, PH3400 and PH3450. The working width is here depending on the model between 3 and 4.5 meters. They are especially for tractors with up to 250 hp. With 12 (PH3300) to 18 (PH3450) tines and a weight of 1,940 to 2,670 kg, they are ideally suited to the requirements of professional agriculture and contractors. In the field of presses and winder Kubota offers a variety of models. These include the fixed chamber presses BF2255, BF3255 and BF3255 FLEXIWRAP. They are subdivided into BF2255 SC-14, BF3255 SC-14, BF3255-SC25, BF3255 SC-14 FlexiWrap and BF3255 SC-25 FlexiWrap. The smallest model, the BF2255 SC-14 measures 4.10 meters in length, 2.52 meters in width and is about 2.30 meters high depending on the equipment. These dimensions also apply to the two models BF3255 SC-14 and BF3255 SC-25. The three, however, differ in weight. The BF2255 SC-14 weighs 2,900 kg, the BF3255 SC-15 3,040 kg and the BF3255 SC-25 weighs 3,340 kg. The model BF3255 FlexiWrap combines the pressing and winding in one machine, which significantly reduces the working time on the field. Once the pressing process has been completed and the net has been wrapped around the bale, the changing table is extended. The bale is then deposited there. Once this transfer has taken place, the tailgate closes automatically so that the next bale can be pressed. Meanwhile, the changing table moves into winding position and the bale is wrapped in foil. A double satellite winder ensures fast and above all stable winding. The foil magazine can be swiveled hydraulically. Since the pressing process takes longer than the winding process, it can not come to a jam here. To keep control of everything while working, Kubota round balers are equipped with a compact ISOBUS terminal, the IsoMatch Tellus GO. This means that all ISOBUS machines can be easily controlled via the 7 inch touch screen. With the Focus 3 Terminal, the driver can see current information about the current pressing process at a glance and adjust the press settings from the driver's seat using softkeys. Kubota offers a variety of machines for sowing. So for example the pneumatic seed drills series SD1000 to SD3000M. The SD1000 series combines compact and lightweight machines that are best suited for small and medium-sized operations. These include the models SD1300, SD1400 and SD1450. The working width is, depending on the model, between 3.0 and 4.5 meters. The seed containers hold 750 or 1000 l. In terms of weight, the SD1000 series moves between 435 and 560 kg. With these seed drill models, the tank is very close to the tractor and in a very low position, which makes filling easier. They are equipped with a 540 rpm V-belt drive (optionally 1000 rpm). The models with a working width of more than 3 m have a foldable coulter bar specifically for transport on the road. Other models are the SD1250M and SD1300M. With working widths of 2.5 - 3.0 m, the SD1000M series is slightly smaller. These are light semi-mounted seed drills for rotary harrows, tine rotors and short combinations. They can be used in combination with various tillage implements or as individual attachment machines. The combination makes it possible to do tillage and sowing in one go. This change is made possible by the coupling system. The SD2000M series is the heavier version of the SD1000M models. They can be built on power harrows and other equipment too. The models SD2300M, SD2350M and SD2400M have a working width of 3.0 to 4.0 m and weigh 618. 732 kg. The seed hopper of these models holds 1050 liters and can easily be filled with the front loader, big bag or screw conveyor thanks to the removable fuel cap. The same applies to the SD2300MP, SD2350MP and SD2400MP models of the SD2000MP series. They are fully integrated in the rotary harrow and seed drill combination. They also offer working widths from 3.0 to 4.0 m. Kubota's largest range of pneumatic seed drills is the SD3000M series. 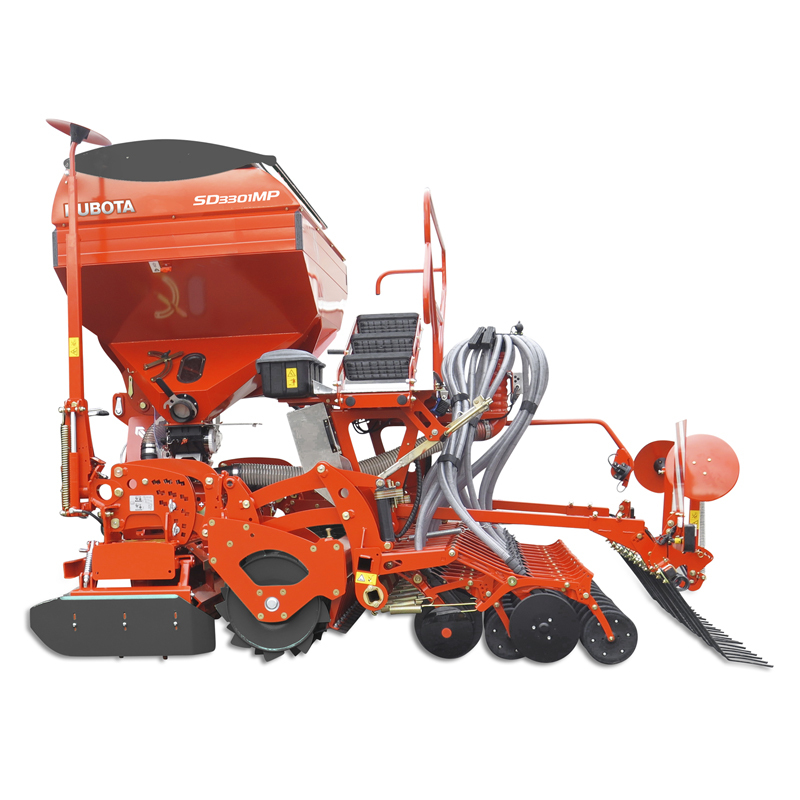 It is part of an integrated rotary harrow / seed drill combination, but can also be used individually by quickly connecting and disconnecting the coulter bar. It includes the models SD3300M and SD3350M with working widths of 3.0 and 3.5 meters and a seed hopper that holds 1200 liters. The weight of these two models is 740 and 870 kg. The mechanical precision seed drills of the MP1000 series are specially designed for the professional sowing of individual grains such as beets, canola or chicory. The models MP1300, MP1600, MP1900, MP1600F and MP1900F are machines with working widths of three, six and nine meters. The maximum transport width of the MP1000 models is 3.0 m. Depending on the model, the weight of this series ranges between 400 kg (MP1300) and 2180 kg (MP1900F). The MP1300 to MP1900 models have a rigid frame, whereas the MP1600F and MP1900F models have a parallel hydraulically folding frame. The row width of all models is 40/50 cm. The grain distances can be infinitely adjusted from 12.5 to 25 cm from the tractor cab. This facilitates the optimization of the seed population within the field. The standard equipment of the MP1000 series also includes the half-side shut-off and the opto-electronic control for seed counting. The IsoMatch Tellus Terminal in the tractor cab ensures greater safety. It constantly checks the operating status of the rows and displays them on the display. The peripheral speed of the seed disc corresponds exactly to the driving speed of the MP1000. That's why it works with zero filing. Thanks to the ISOBUS technology, the MP1000 sowers can be easily controlled via the terminal. GEOCONTTROLL enables precise sowing as the seed drill is automatically switched on and off in the right place based on GPS data. In conjunction with the GEOSEED, sowing in triangular or parallel connection is possible. A precise sowing has the consequence that subsequent care work is simplified and thus the possible yield is increased. Kubota's disc mowers can be divided into five different product lines. DM1000, DM2000, DM3000, DM3300 and DM4000. The DM1017, DM1022 and DM1024 are among the smallest in the DM1000 range. They have a working width of 165 - 240 cm and weigh between 388 and 450 kg. Due to their low power requirement of 36 to 46 hp (26 to 34 kW) they are especially suitable for smaller tractors. The swath width of the DM1000 mowers is 1.20 to 2.0 m. The next larger mowers are out of the DM2000 range. The models DM2028 and DM2032 have a working width of 2.80 or 3.20 m. Their weight is 609 to 643 kg. The power requirement for these models is at least 50 or 55 hp (37 and 40 kW). The cutting height can be adjusted as required on the DM1000 and DM2000 via a top link. One size bigger are the mowers of the product series DM3000 and DM3300. These include the models DM3028, DM3032, DM3036, DM3040, DM3087, DM3095, DM3332, DM3336 and DM3340. The three DM3300 models have a power requirement of 55 to 70 hp (40 to 50 kW) and have working widths from 3.18 to 3.94 m. The smaller DM3000 models offer working widths from 2.84 m. The larger models of this series, the DM3087 and DM3095, are center-mounted for working widths of 8.70 and 9.50 meters. These two have a power requirement of 140 and 150 hp (105 and 110 kW), which means that they can also be used with relatively small tractors. They are specially designed for mowing large fields. The DM4028, DM4032 and DM4032S models form the DM4000 series and have a working width of 2.80 to 3.32 m. Their weight is 670 to 855 kg. These mowers have a power requirement of 33-45 kW (45-60 hp). Both Kubota XMS series are available with both aluminum and steel spray boom. The XMS1 series includes the three field sprayers XMS18, XMS110 and XMS112. They offer, depending on the model, a working width of 12 to 21 m. The sprayers are designed with the center of gravity as close to the tractor as possible for optimum weight distribution. For the XMS1 field sprayers pumps with a capacity of 100, 150 and 200 l / min are available. The maximum volume of the main tank is 956 (XMS18), 1185 (XMS110), or 1395 (XMS112) liters, depending on the model. The machine weight varies from model to model and depending on the boom variation between 889 kg (XMS18 with HOSA 12 m boom) and 1317 kg (XMS112 with HC 21 m boom). Also on the XMS2 models are both aluminum and steel spray boom available. The XMS2 series includes the four models XMS210, XMS213, XMS216 and XMS218. These have, just like the XMS1 sprayers, the Easy Hitch. Thus, the user has enough space to couple propeller shaft and hydraulic or electrical connections. If the field sprayer is then coupled and excavated, the driver is indicated by a locking system, if the machine has been connected correctly. As soon as the parking supports are folded in, the field sprayer is ready for use. The poles available for the XMS2 series are 15 to 30 meters long. The main tanks hold, depending on the model, a maximum of 1100, 1450, 1800 and 2000 liters. In addition, the XMS2 field sprayers have an 18 liter hand wash tank. For the control of ISOBUS electronics, the XMS2 series can choose between the switchbox, the combination of Switchbox and IsoMatch Tellus GO and the combination of Switchbox and IsoMatch Tellus. An appropriate joystick for IsoMatch Tellus and Switchbox is available as an option. The Kubota KX series mini diggers are conventional wheeled excavators in the 0.8 to 8.2 ton category. Among them are the models K008-3, KX018-4, KX040-4 and KX080-3S. The offered models vary depending on the market. The latest models on the German market are the KX027-4 (HI), which has a gross weight of 2,590 kg, the KX030-4 (HI) with an operating weight of 2,790 kg and the KX042-4 with 4,125 kg. The KX series is specifically tailored to the needs of customers. For example, the two models KX030-4 (HI) and KX027-4 (HI) can convince with the largest cab in their class. Nevertheless, they have compact dimensions. The KX027-4 (HI) measures only 4,370 x 1,400 x 2,420 mm (LxWxH) with the cab. The KX030-4 (HI) is only 20 cm longer and 10 cm wider at 4,570 x 1,500 x 2,420 (LxWxH). But also the KX042-4 can be used with a length of 5,085 mm, a width of 1,700 mm and a height of 2,485 mm and the other KX models easily in confined spaces. In order to be able to perform well, the mini excavators of the KX series were equipped with powerful engines. The KX027-1 (HI) and the KX030-4 (HI) have a water-cooled diesel engine with E-TVCS system delivering 23.8 and 24 hp, respectively. The engine of the KX042-4 is also a water-cooled diesel engine. This does not have the E-TVCS system. He makes 39.4 hp (29 kW). Furthermore, the latter can shine with the ECO Plus mode. This lowers fuel consumption of the KX042-4. In addition, an integrated diesel particulate filter (DPF) ensures cleaner exhaust gases and thus more environmentally friendly working. 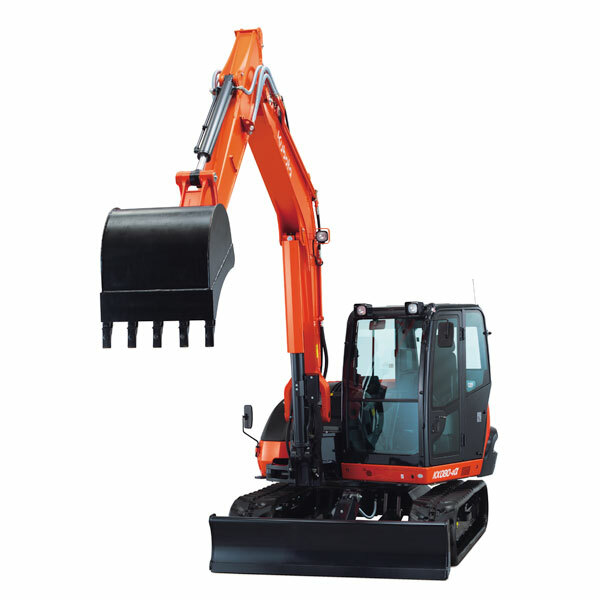 The Kubota U-Series offers a wide range of short tail excavators. With models such as the U10-3, the U20-3α, the new U36-4 and the U55-4, Kubota offers a variety of suitable excavators for tight construction sites U-series should meet all the requirements of customers. These include manageable dimensions, performance, comfort and ease of maintenance. With a power of 10.2 to 46 hp and a service weight of 1,120 to 5,400 kg, the U models cover a large area and the customer can select the most suitable machine from the program. The U-Series, according to Kubota, offers the best-in-class breakouts, a high level of comfort and tremendous versatility. The comfortable driver's safety cabin offers a large entry, a multi-adjustable comfort seat and a large footwell, which provides the driver with a degree of comfort. The undercarriage of these short tail excavators is hydraulically adjustable on most models. This way, the track can be widened as required, thus ensuring greater stability. The construction of the U-Series ensures that the rear swing radius is within the chain width, which allows the driver to concentrate fully on his work even during demanding swivel maneuvers, without being distracted, with the rear not facing an obstacle advised to damage this and the excavator thereby. This also improves safety during work. With compact widths from 750 (U10-3) to 1960 mm (U55-4), these excavators can easily handle tasks in very confined spaces. Kubota's smallest chain dumper is the KC70. This dumper scores above all with very compact dimensions. With a total length of 2,300 mm, a width of 880 mm and a total height of 1,360 mm (with ROPS safety device 1,960 mm) can be operated on very narrow construction sites. Due to the swinging rollers, this model makes it possible to easily compensate for bumps and small obstacles through the chain. The KC70 is also available in several versions. In addition to the KC70 there are the KC70H-4, KC70HV-4, KC70VHD-4, KC70SL-4 and KC70VSL-4. These variants also impress with their compact dimensions. The largest model among them is the K70VHD-4. It measures a maximum of 2,224 mm in length, 1,625 mm in width and 1,058 mm in height. The loading bucket is controlled by two hydraulic cylinders mounted under the dump body. There they are particularly well protected and high manpower is guaranteed. But even the larger KC100 models, the KC100HD and the KC100HR-4, are convincing with their compact dimensions and effective applications. The KC100HD measures 950 mm in width and is only 2,640 mm long and 2,015 mm high with ROPS safety device. With the Kubota KC100HD, the bulk material can tip over forward and to the sides. The KC110HR-4 even has a charging trough rotatable through 180°. The two largest chain dumpers from Kubota are the models KC250H-4 and KC250HR-4. The KC250HR-4 is 2,105 mm long, 1,300 mm wide and 670 mm high, slightly larger than the KC250H-4. This measures 1.637x1440x400 mm. The KC250HR-4 also has a rotatable dump body like the KC100HR-4. Like the smaller KC100HD, the KC250H-4 is equipped with a dump body that can tip over in three directions. The three Kubota wheel loader models that are available on the German market are the R065HW, the new R082 and the R085. All three are powered by a Kubota diesel engine. The two models R065HW and R082 have a engine power of 47.3 hp (34.8 kW). The R084, however, provides 62.2 hp (46 kW). The noise level of the motors and the vibrations are low. Also low is the fuel consumption of these models. Overall, Kubota's wheel loader also scores with ease of maintenance. This makes it easy to reach all the important maintenance points, resulting in a quick and easy daily maintenance routine, resulting in a shorter service life. Sufficient security is also provided. For example, the wheel loaders were equipped with 6 easily accessible lashing points, enabling the load to be secured accordingly during transport. In order to ensure sufficient safety even after the work is done, the anti-theft system of the Kubota wheel loader includes coded keys. The spacious cabin with ergonomically designed dashboards ensures enough comfort during work. In addition, the cabin offers, according to the manufacturer, an excellent all-round visibility. This way, the driver always has everything in view and can maneuver the wheel loader with ease. In addition, modern digital displays, a sprung driver's seat and adjustable armrests and steering column add to the comfort. This allows the driver to work with the machines tirelessly for a longer period of time and to complete his assignment more relaxed.